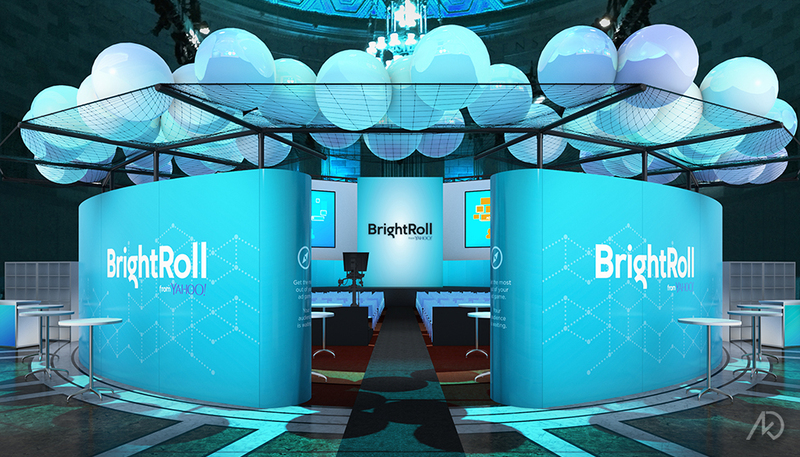 The following 3d illustrations showcase a design for a major event for Yahoo’s BrightRoll brand. 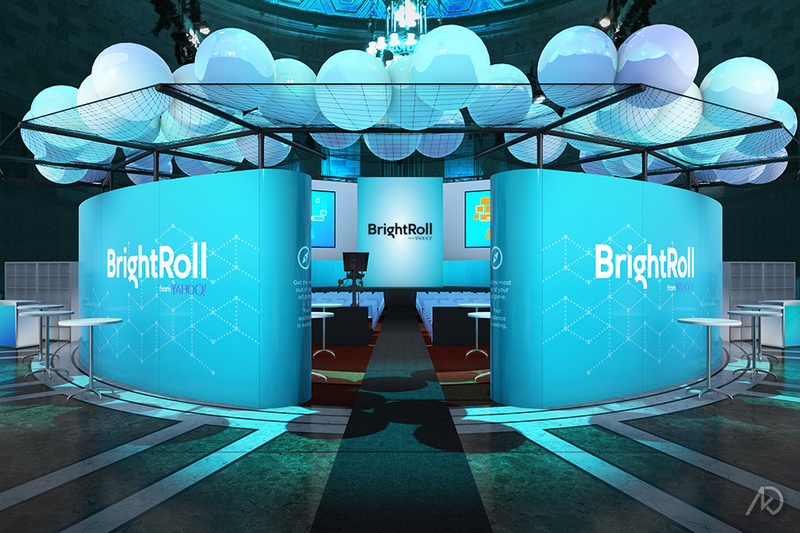 The event was to take place in New York City; Gotham Hall. 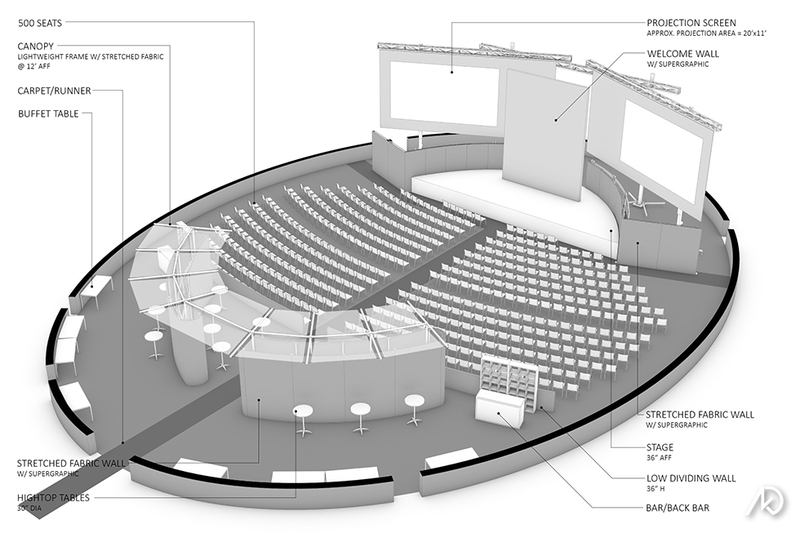 The basic program requirements are seating for 500 attendees, a stage, projection screens, and an area to eat/drink/lounge. the entry area, the designed walls surround the existing walls while supporting a lightweight canopy that helps to lower the scale. This allows for a more intimate entry and a more comfortable lounge space. 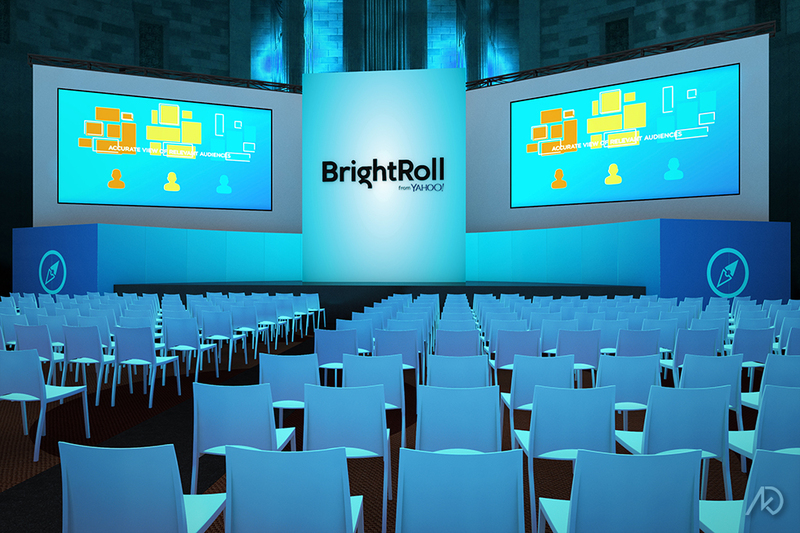 In front of the 500 seats is a stage, a large welcome wall with branded graphics, and two large rear-projection screens. 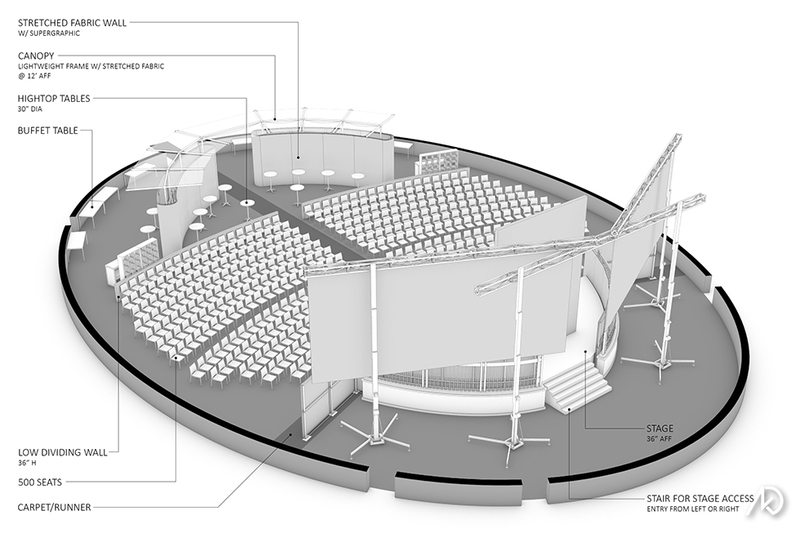 The stage is accessible in the rear, which also serves as back of house and service area. The plan and axon diagrams show a slightly earlier version than the rendered views. From the plan you can better understand the four existing arc-shaped half-walls; hey define the main usable space. My first design challenge was getting 500 chairs to fit nicely into the given space. Once that was achieved, the half-walls were covered with printed stretched fabric walls, and the rest fell into place with the space left over. The axon diagrams show the stretched fabric walls that cover the existing half-walls in the front and in the rear of the space. One can also get a better understanding of the large screens and the stage access from the rear axon diagram. The rendered views were used to better understand the proposed lighting and graphic treatments on all surfaces. 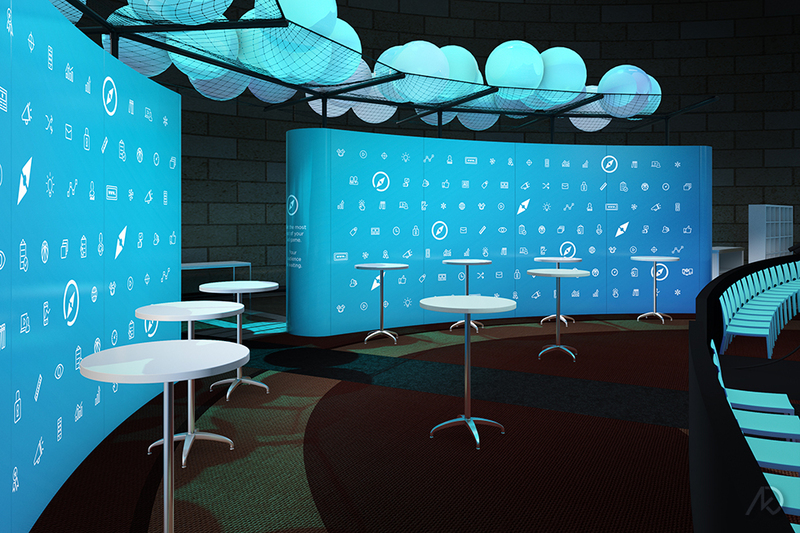 The printed stretched fabric walls in the entry will have branded graphics on both the entry side and lounge side. 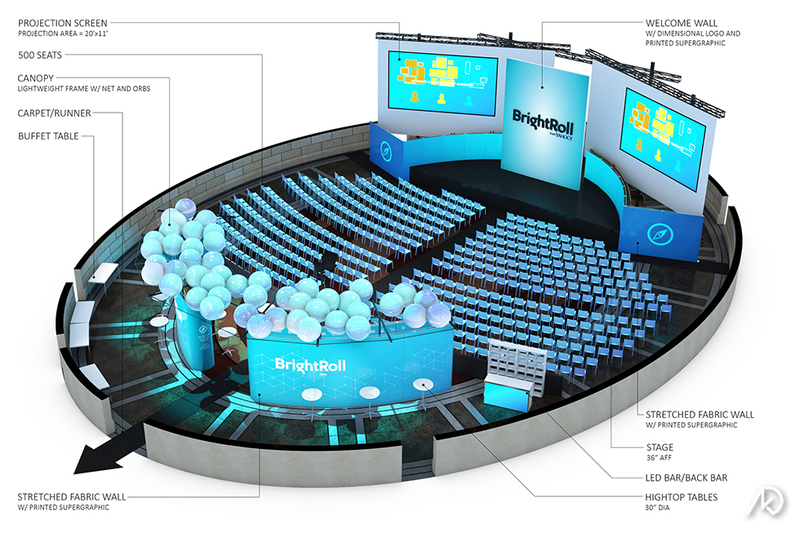 The large welcome wall (center stage) will be a simple logo lock-up and the stretched fabric walls surrounding the stage will mostly be a gradient. 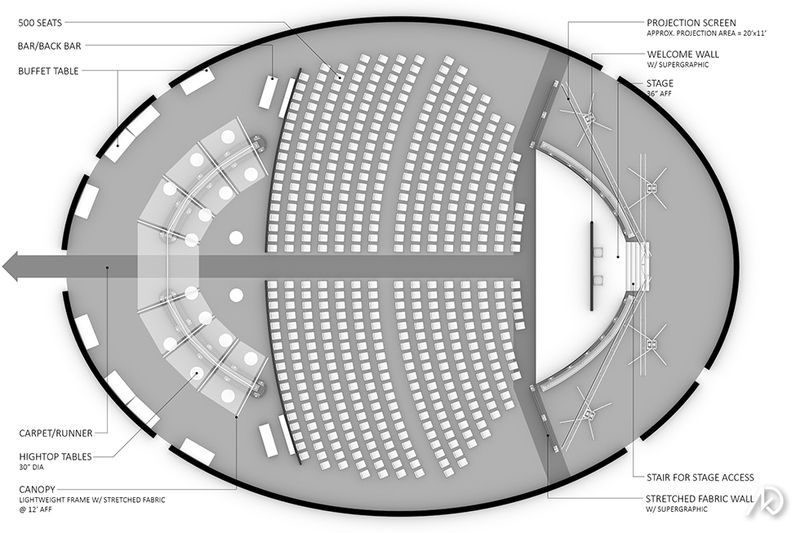 The views shown are an updated axon diagram, the entry, stage, lounge, and a view from the mezzanine looking down onto the main floor.